Backed by brain research, California schools are beginning to address the effect of severe trauma on the health and achievement of their students. In districts including Humboldt, Richmond, Santa Cruz, Aptos and San Francisco, groups of teachers are being trained to recognize that students’ explosive anger, classroom outbursts, habitual withdrawal and self-injurious behaviors could be symptoms of traumatic stress, the result of repeated exposure to violence, abuse and neglect. Shatandra Saulters, 20, did homework packets and paid Billy Bush Academy to get a diploma, but she learned it won’t get her anywhere. Literacy advocates say there’s a burgeoning market of groups that claim to be private accredited schools peddling useless high school diplomas. 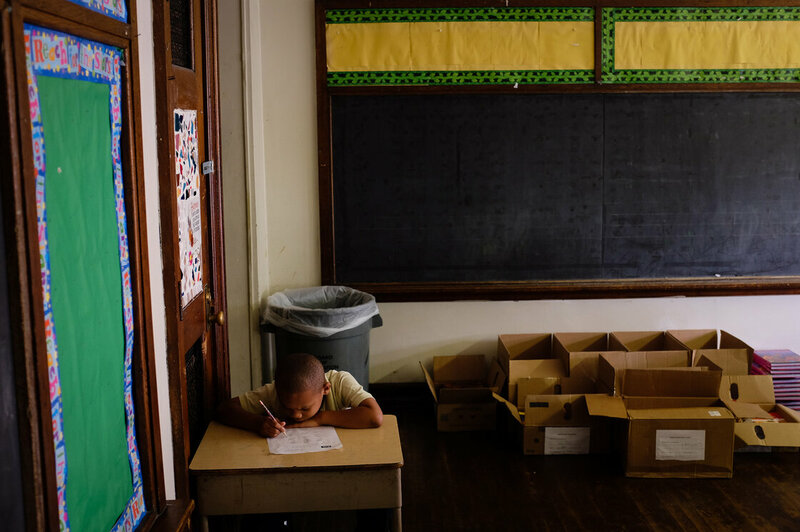 Third-grader Kassim West last July at Walter G. Smith Elementary School, one of more than 20 Philadelphia public schools that closed at the end of the school year. This is the first in a three-part report on Philadelphia schools in crisis. 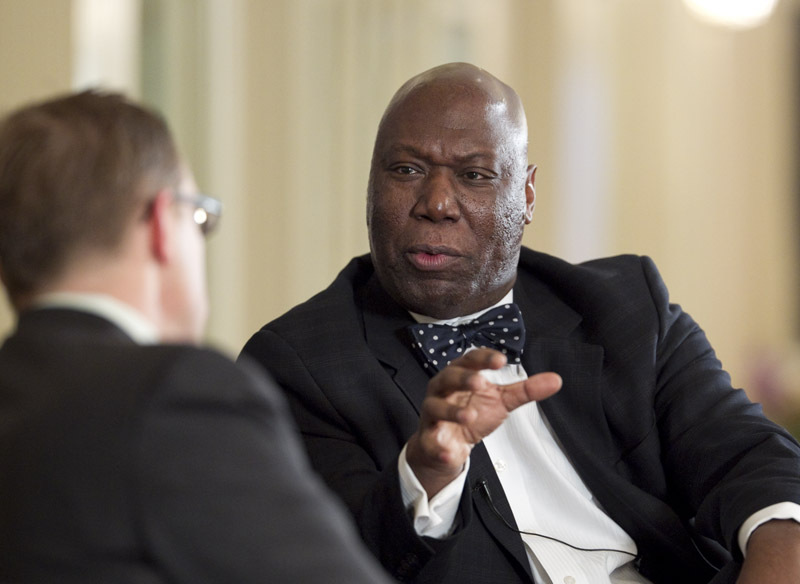 Railroad Commissioner Michael Williams announces U.S. Senate candidacy at TribLive on January 27, 2011. At a Friday gathering of educators, school administrators and student assessment specialists in Austin, Texas Education Commissioner Michael Williams announced he would defer implementation of a rule that requires state end-of-course exams count for 15 percent of high school students’ final grades. The announcement, which earned a standing ovation in a crowded hotel ballroom, came a day after Gov. Rick Perrydeclared his support for such a change and as Senate Education Chairman Dan Patrick, R-Houston, has filed legislation that would permanently leave the decision of whether to apply it up to local school districts. Jazmine Hernandez (left) and her cousin Alfonso Lucio are in their freshman year at St. Edward’s University in Austin. They are among 42 freshmen entering St. Edward’s this year through the federal College Assistance Migrant Program. Eighteen-year-old Alfonso Lucio remembers the sun beating down on the back of his neck as he toiled in asparagus fields in Michigan, something he began doing at age 12. His cousin Jazmine Hernandez, who is the same age and also came from a family of migrant farm workers, was often at his side. It took the help of a decades-old federal program that focuses on migrant students, but he was right. Last month, as the cousins had lunch in a dining hall at St. Edward’s University in Austin, days before starting their freshman year, they beamed with pride even as they wiped away tears. Rice University will provide professional development for 150 high school science teachers from the Houston Independent School District (HISD) during the 2012-13 school year. The new Rice Excellence in Secondary Science Teaching (RESST) program is funded by a $1.1 million contract from HISD with additional support from Texas Regional Collaboratives. Texas High School Graduation Rates Improve, but Why? Free Summer Meals For Youth! Free summer meals are available for youths ages 1-18 through June 4-August 12, 2012! No registration is required to eat; just show up at a site near you! The Summer Food Program provides nutritious free meals to children 18 and younger in lower-income areas during summer when school is not in session. It is in more than 460 operating sites. Children must consume food on site. Find a site near you call : (713) 676-6832 and give the operator your zip code! More information on Summer Food Service Program in Houston, visit here! Check out more about Summer Feeding Program here! Need help financing your College Education? Once again HISD board trustee, Paula Harris is associated with a scandal this time in the naming or renaming of a District IV school. The third ward community at large alleges that Paula Harris has committed acts in violation of a public trust for possible political gain in an attempt to circumvent board policy in regards to naming the new building located at 3200 Rosedale in District IV. The actions are apparently supported by HISD District administration. The clear intent of the Board policy is to solicit true community input and to Improve Public Support and Confidence in Schools and to promote a culture of trust through action which clearly is a joke. There is much distrust for DIS-TRUSTEE Paula Harris and some HISD personnel. The Houston Independent School District cannot be trusted even with something as simple as naming a school and we trust them to educate our children!!! The third ward community clearly sees the efforts to destroy our community through the destruction of our schools and most recently with the projected closing of Ryan Middle School. WE WILL NO LONGER TOLERATE THESE ACTIONS AND PROMISE TO PICKET AND PROTEST THESE THINLY VEILED ATTEMPTS TO TAKE THIRD WARD, DESTROY OUR HISTORY, AND EXPAND MIDTOWN. The community furthermore seeks to have Paula Harris sanctioned and precluded from voting on the agenda item. Her actions have clearly violated our public trust. The Community has repeatedly asked for justice but we have been ignored. The only way to stop this injustice is to expose them. If policy is not followed by the administration then how are district personnel and children expected to follow policy!!! The community will not be disrespected and disregarded in this matter nor will they support a bond issue in the fall and in fact, promise to fight vehemently for its failure!!!! HISD is moving the principal of Kashmere Senior High School immediately and replacing him with an interim a week before the state assessment for English Language Arts and a little more than a month before the state assessments for Math, Science, and Social Studies. This midyear change threatens to undermine the gains in campus culture, student morale, and massive academic interventions. Ninth-graders will get a reprieve from a state requirement that a student’s performance on new end-of-course exams count toward 15 percent of the final grade, Texas Education Commissioner Robert Scott announced Friday.